Being the last mountain-top finish of the race, the 230 kilometers stage from Andorre to Saint-Lary-Soulan was expected to be one finale chance for an important reshuffle of the general classification. While as usual, the top spot of the podium was already secured by the Spanish legend, Miguel Indurain, the fight for the other two honourable places promised to be spectacular. Collado del Canto, Puerto de la Bonaigua, the Portillon and the Peyresourde were the climbs serving as legs-breaking appetizers. The Col de Peyresoude saw lot of action and was raced at a quite aggresive rhytm. The selection was made and at the foot of Pla d'Adet, there weren't more than thirty riders in the front group. Having full confidence in their leader Tony Rominger, the Spanish Clas-Cajastur team hits the climb at an unseen before, scary speed. Escartin, Mauleon and Jon Unzaga as the last rocket, succesfully managed to put Tony in a great position to attack. 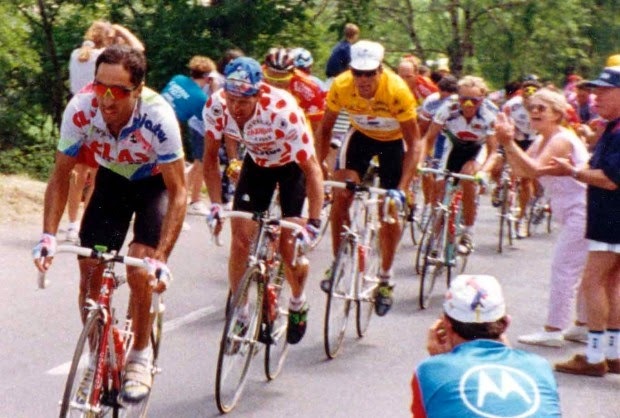 The brutal , big ring acceleration comes as expected and only the yellow jersey, Indurain can follow. The rhytm, described by the Spanish TV commentators as "infernal, frenético", asphyxiates on the spot the colombian Mejia, the second in the Tour classification. On the other hand, the biggest surprise of that edition of the Tour, the Polish Zenon Jaskula succeeds to catch the two leaders. Without asking for a single relay, Rominger pushes his huge gears up to the top of the climb. Only in the last 200 meters he is overtaken by Jaskula, who beats him to the line. Hautacam Top 100: Go big or go home! Impressive ascent times on Pla d'Adet! Thibaut Pinot signs a new Port de Bales record! New record of speed on Risoul!